Walker's Kaye-Loni Bowden won both the 1600-meter and 3200-meter runs ahead of Live Oak's Kylie Zeller. Albany High's Abby Howell releases the shot put during the girls large school division. Walker High's Lilly Waguespack clears the bar during the girls high jump large school division event. Live Oak's Mary Grace Byers makes an attempt in the girls high jump large school division. 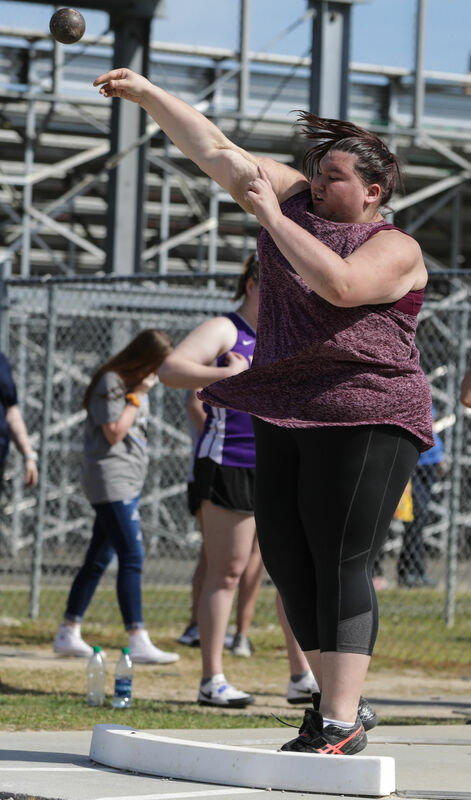 Denham Springs High's Natalie Stewart heaves the shot put during the girls shot put large school division. Walker High's Ralynn Johnson goes up to clear the bar during the girls high jump large school division. Live Oak's Rylie Butler releases the shot put during the girls shot put large division. Walker's Tarondia Harold crosses the finish line well in front for a win in the girls 4x200 relay. Denham Springs' Gabrielle Davis tries to catch Albany's Amaya Taylor on the back stretch of their 4x200 meter race. Kaye-Loni Bowden wins the girls 1600 meter race for Walker High in the large schools division. Walker's Ralynn Johnson (left) edges Live Oak's Mackenzie Covington in the girls large school 100-meter hurdles. Walker High's Tarondia Harold (left) pulls ahead in the large school 100-meter dash.